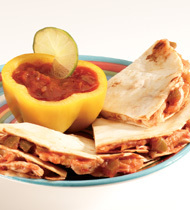 Try our Alamo Chicken Quesadillas made with our Pace® Picante Sauce. Made in about 30 minutes, this simple and quick meal is sure to be a crowd pleaser. Monterey Jack cheese, shredded	 2 lb. 2 qt. flour tortilla, 8-inch	 64 ea. 1. Mix chicken, cheese and picante sauce. 2. Spray one side of 32 tortillas with vegetable cooking spray. Place, oiled side down, on baking sheets. 3. Spread 1/3 cup chicken mixture on each tortilla to within 1/2 of edge. Top with remaining tortillas, pressing firmly. Spray tops with vegetable cooking spray. 4. Bake at 450º F. (conventional over) for 10 minutes or until tops are golden brown. 5. Remove from oven and cut each quesadilla into 4 wedges. 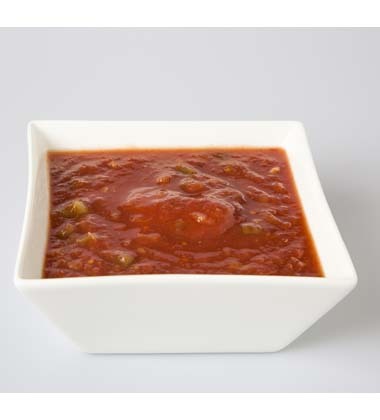 CCP: Hold at 140º F. or higher.Serve each quesadilla with 1/4 cup Pace® Picante Sauce (Medium).Serving Suggestion: Serve as an appetizer. Garnish with cilantro or parsley sprigs and/or a dollop of sour cream. Monterey Jack cheese	 2 lb. 2 qt.